Producer and animator Mike Bell spoke at the Duncairn Centre for Culture and Arts yesterday as part of the Ulster Festival of Art & Design. 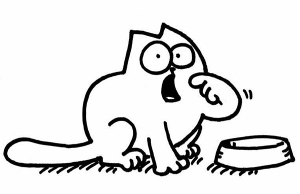 Mike is one of the driving forces behind the phenomenon that is Simon’s Cat, which for those (seemingly few) who don’t know is a low-fi black and white cartoon about the misadventures of a cat and his owner… Simon. I say seemingly few because Simon’s Cat animations have had over 618 million views since 2008, technically, it is the world’s largest animation show. Mike told us their story, how luck and timing mixed with hard grafting and talent, and properly harnessing social media , developed their IP into the huge success it’s now become. It was particularly interesting to me because while I’m not (yet) trying to develop and IP, I am trying to develop an online presence where people can view my work and my progress and hopefully get something positive from that. Mike talked of how the digital age has been a game changer for artists and creators in that they are masters of thier own destiny to an extent. There doesn’t have to be any interference from corporates or external parties trying to steer their idea into dark waters. They can partner with whoever they like, they can pivot the “brand” however they like – nice to see success happen that way. We all want to have our work recognised and have an audience who are enjoying the journey you’re taking them on and social media allows for that level of engagement to happen. As far as future plans go, Mike will be opening an animation studio based in Belfast, called Encycle, later in the year. It’s excellent to see such a figure returning to NI to contribute to the province’s growing creative sector – looking forward to seeing what gets produced there.